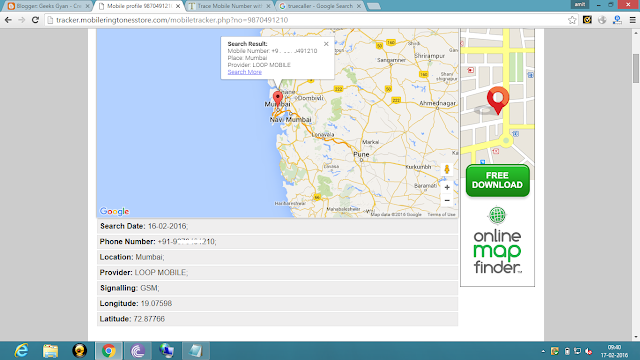 Today GeeksGyan is Back with Amazing Trick to Track any mobile number with owner's exact address And Name. The mobile phone help's you to communicate with your friends all over world. According to a survey India is the second largest country which has a large number of Mobile phone users.Today's one of the most Major problem is that increase in getting unknown Missed calls and Prank calls. Sometimes it becomes very necessary to Know the owner's Name and address of that unknown Phone number. Therefore, today in this article we are sharing a guide in which will you learn to trace unknown mobile number with owner's Exact name,Opetator and address. Now select your country and then put your 10 digit mobile number in the search bar. After entering mobile number, sign in with facebook / Google/Yahoo account to trace the unknown mobile number. After successful Sign,you can easily trace any mobile number location with owner name. If you Don't have Internet Data to check that unknown number on your phone Then Don't Worry TrueCaller also provide SMS service to trace any mobile number location with Name,operator and Andress. For tracing any mobile number location Type SMS “Trace < 10 digit mobile number Which u want to trace> and send to 54444. Now After sometime You wil get reply From truecaller with his Name, Service provider and it’s location. Normal SMS charges may apply. Now enter the number which you want to trace in the search column. Now you will get location of the unknown number on map. So thsese were the tips and tricks to trace a mobile number location with exact owner name, operator name,location and address.I hope that you liked the post so don't forget to share it with your friends. Lovely, its works , this is quite useful of application which are used for content transfer from mobile to mobile ...Perfect. Hey Thanks Hemant For sharing your Feedback with us.